Now there are people who do not like pastries at all. I have met them. But you won't find them in line here at 342 East 11th Street, home of Veniero's Pasticceria & Caffé. I won't claim that desserts at Veniero's are the ne plus ultra of the pastry world, but they are excellent and well respected. 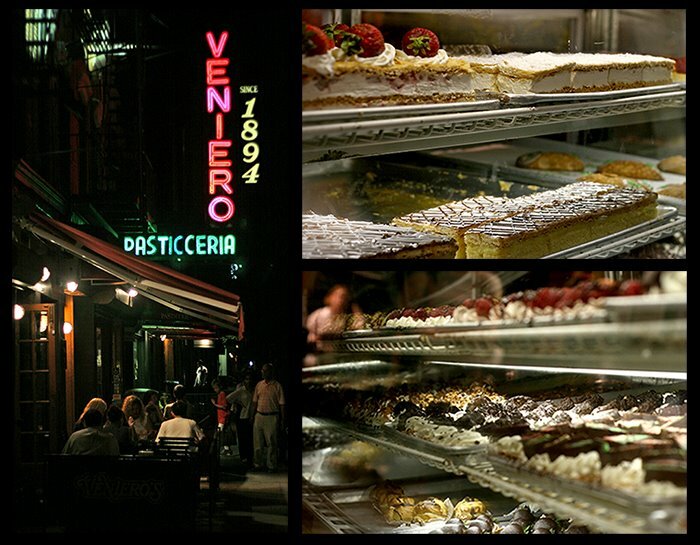 Veniero's is a New York City institution, started in 1894 by Antonio Veniero and kept as a family run business ever since. You can read more about them here. The bulk of the business is takeout and suppliers to restaurants around the city. You can also eat in their cafe from their extensive menu. There are certain rites of passage I believe every city dweller should go through to be a bona fide New Yorker. After all, imagine being at a social gathering where discussion turns to a discussion of favorite cheesecakes - Junior's or Eileen's - and the embarrassment when you have to admit you have never been to either. Be prepared for the conversational snub and relegation to social siberia. Of course a rite of passage is not always pleasant - just de rigueur for initiation (or should I say di rigore?). They come in many forms: hazing, breeching, scarfication, baptism, Bar Mitvah, the aboriginal walkabout, Masonic rituals and the debutante ball. But here at Veniero's your compulsory initiation rite will include requisites like biscotti, miniature pastries, a myriad of cookies, cannoli, tiramisu, sfogliatelle and my personal favorite: strawberry millefoligie. That's not such a painful bad rite of passage, is it?